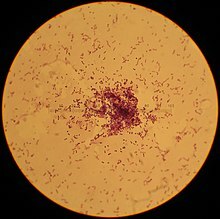 Lactococcus is a genus of lactic acid bacteria that were formerly included in the genus Streptococcus Group N1. They are known as homofermenters meaning that they produce a single product, lactic acid in this case, as the major or only product of glucose fermentation. Their homofermentative character can be altered by adjusting environmental conditions such as pH, glucose concentration, and nutrient limitation. They are gram-positive, catalase-negative, non-motile cocci that are found singly, in pairs, or in chains. The genus contains strains known to grow at or below 7˚C. These organisms are commonly used in the dairy industry in the manufacture of fermented dairy products such as cheeses. They can be used in single-strain starter cultures, or in mixed-strain cultures with other lactic acid bacteria such as Lactobacillus and Streptococcus. Special interest is placed on the study of L. lactis subsp. lactis and L. lactis subsp. cremoris, as they are the strains used as starter cultures in industrial dairy fermentations. Their main purpose in dairy production is the rapid acidification of milk; this causes a drop in the pH of the fermented product, which prevents the growth of spoilage bacteria. The bacteria also play a role in the flavor of the final product. Lactococci are currently being used in the biotechnology industry. They are easily grown at industrial scale on whey-based media. As food-grade bacteria, they are used in the production of foreign proteins that are applied to the food industry. ^ a b c Parte, A.C. "Lactococcus". www.bacterio.net. ^ Schleifer KH, Kraus J, Dvorak C, Kilpper-Balz R, Collins MD, Fischer W (1985). "Transfer of Streptococcus lactis and related streptococci to the genus Lactococcus gen. nov". Syst. Appl. Microbiol. 6 (2): 183–195. doi:10.1016/s0723-2020(85)80052-7. ISSN 0723-2020. ^ de Vos, W.M. Simons, GFM. Genetics and Biotechnology of Lactic Acid Bacteria. eds. Gasson, M.J. de Vos, W.M. Gene Cloning and Expression Systems in Lactococci. Blackie Academic & Professional, 1994. pg. 52 – 53. This Streptococcaceae-related article is a stub. You can help Wikipedia by expanding it. This page was last edited on 3 February 2019, at 17:49 (UTC).